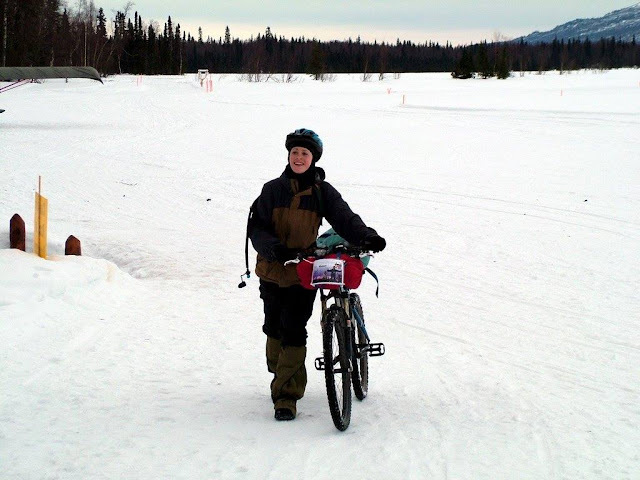 This is my favorite portrait from any of my races, taken by a volunteer at the Eaglesong Lodge/mile 46 checkpoint during the 2006 Susitna 100 — my first race. I love the floppy overboots, the dangling Camelbak hose, the 2003 Gary Fisher Sugar with 26" studded tires and plastic pedals, the bulging stuff-sack bundle on a seatpoast rack. Most of all, I love that blissed-out look on my face. I was in awe of the expansive Susitna Valley, the notion of being 46 miles from anywhere in Alaska, and the fact that I was out there, and I was doing it. This was quite the revelation, and set me on a path that I continue to follow a decade later — seeking out endurance races as a way to focus my emotions, expand my perceptions, find flow, and experience life at an intensity that never ceases to amaze me. Although this is all possible in non-race adventures, I appreciate organized races for their community and support, and also because perimeters force me to think and act outside my own boxes. Ultimately my goal with racing is to see how far I can go. Unless something about my life changes substantially, I imagine I'll continue to participate in races for years to come. • I've participated in 80 races since February 2006 — 22 bicycle races, 57 foot races, and one triathlon. • The most races I participated in one year was 20 in 2012 — three bicycle races and 17 foot races. • Before I even considered myself a runner (2006-2009), I participated in five foot races and one triathlon. • My longest race was the 2009 Tour Divide — 2,745 miles — and my shortest was the 2008 Spring Tide Scramble — 4 miles. • The fastest time I ever posted in a bicycle race was 11:35 in the 2014 White Mountains 100; I never spent fewer than 11.5 hours racing a bicycle. • I've participated in seven 24-hour mountain bike races. • I've DNF'd eight races — three bike and five foot races. The reasons I listed were "timed out" (4), "frostbite" (1), "achilles pain and lost heart" (1), "knee injury" (1), "pneumonia" (1). • I hold the course record in one race, the Berry Creek Falls 50K in Big Basin State Park. I finished in seven hours and 50 minutes, but it was the only year the 50K distance was offered at this race, and I was the only woman. I know, I know. The race director for Coastal Trail Runs still reminds me this is an official course record nearly every time he sees me. • My race list may seem obsessively lengthy, but it pales in comparison to Beat's. The link to my Race Page is here. Included are links to 80 occasionally multi-part race reports, which must be up to the 10-million-word range by now. Fun airplane reading. I hope you read my other comments on your past blogs about the physical aspects but also emotional. psychological parts of us that make up the whole.As an example, the "inner " critic can be a parent that lives inside of us that is still giving us the message that tells us to keep pushing beyond our limits to justify not being the "perfect child" or that we are a failure because of their own projections or messages that they heard as children etc... We are not just bodies to be used as machines.It's good to test ourselves sometimes and to go past our comfort zone but a lot of times if it becomes excessive then it's running away from issues too.You are an inspiration for women especially but I really enjoy your insights into your emotional, spiritual life even more.There is the inner journey that is equally important.I love the photos and your blog. Physical problems tho can have deeper soul meaning and if we don't listen to our souls she will not be denied.Even tho I'm 62 I have to remind myself of this too...ha Life is to be enjoyed in the moment not to race thru.I'm a turtle not a hare. Awesome sauce!! This is going to be a fun, fun and educational read!! I'd say you have developed an aerobic base. nice! love the race reports! Jill: good luck on your DecaMontebello! One of these weeks you should try out the Low-Key Hillclimbs, which were on Montebello 03 Oct. Bohlman is a particularly type-II fun course, but it's coincident with your Montebello climb-fest. Like you I also really love trail runs, but only as long as I can actually run them -- when it gets to the point of death-march, I feel as though I should have done a shorter distance. It's hard to balance running and cycling, though, and be good at both. Completely understandable. I consider myself a hiker who uses running to increase my distance and efficiency. I have little interest in running shorter distances "fast," and don't imagine that will change, but I never say never. I will show up for a Low-Key Hillclimb one of these days, but I am terribly intimidated by riding on roads among large groups. Funny how this hasn't changed since my first century ride in 2004.